If you are looking for an exciting food-related business to start then consider the advantages of opening a teashop. A teashop? Well, yes. Over the last few years, teashops have been enjoying something of a renaissance. The best and most successful offer simple, light, all-day dining and impeccable service in an elegant, stylish space. Their customers drop in for breakfast, mid-morning coffee, lunch and, of course, afternoon tea. Many of these teashops also sell cakes, scones, breads, pastries and other comestibles to take away. Some undertake outside catering and publish their own books. Best of all, a teashop’s owner, unlike a restaurateur, does not have to work unsociable hours. This course is designed for anyone with teashop opening dreams. There is a talk by Blathnaid Bergin on setting up and running the business which covers such topics as premises, costs, food hygiene, staff, marketing and – of course – optimising profitability. 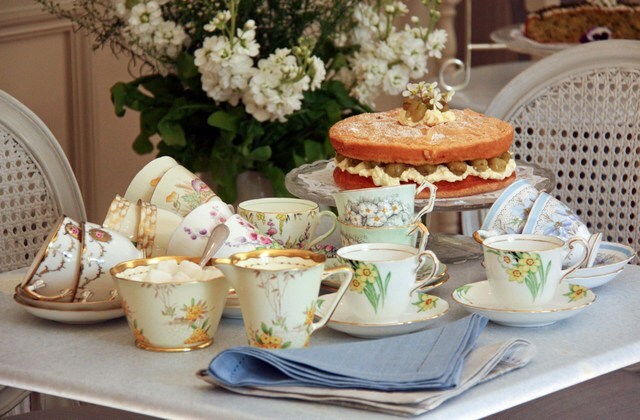 Darina and Pamela Black will provide lots of practical tips and advice on everything from choosing your menu to choosing your tablecloths and will include some real-life case histories of popular teashops from around the world. There will be three demonstrations by Darina and Pamela (covering cakes, biscuits, scones, slices, sandwiches, salads, jams, preserves, light meals...basically, everything you are likely to want to put on your menu) and three "hands-on" practical sessions for you to work with the school’s top chefs to make whichever recipes you choose. And if there are techniques you’d like to master – such as icing a cake – then there will be plenty of opportunities to learn. Finally, there will be a short talk on specialist teas and brewing the perfect cuppa. Lunch is included on each day. Each morning begins with Breakfast at 8:30 for all our students. This is a time to enjoy the morning sunshine in our farm dining room and get ready for the day with a bowl of steaming hot porridge, jersey cream and local honey, freshly made bread and Irish farmhouse cheese and a nice strong cup of coffee. On Monday you will have a full day of lectures, combining a selection of great cafe and teashop recipes with a wide range of information on ideas for Menus, how to manage your costs and where to source your ingredients. Once you have chosen what you will cook for the following morning, its off to the cottages for a well earned rest. For the rest of the week (after a good breakfast each morning) you will cook a selection of dishes under the watchful eyes of our teachers where you will learn the important tips and tricks to get the best out of the recipes and your ingredients. After you have sit down to enjoy lunch you will have an afternoon demonstration with a further set of recipes. By Friday afternoon you will have mastered numerous new recipes and techniques and be ready to take the next step towards opening your own tea-shop. Courses on during week of 7th April.